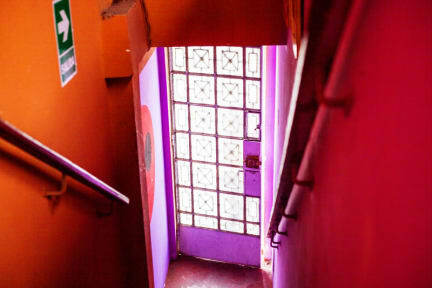 Aeropuerto Hostel is a Residential (250m2)House, local hostel in Lima close to the airport, has 2 bedrooms (1 double room and quadruple room) kitchen, dining area WiFi and 2 bathrooms. We offer the following services: lodging, breakfast, WiFi, taxi service to the airport. Aeropuerto Hostel is located in the same Faucett Avenue, one block before the Venezuela Avenue in the neighborhood of Bellavista. We are in a very safe and residential neighborhood, near the main avenues such as Venezuela, close to the main points of the Peruvian culture as beach (20 minutes) Archeological ruins (20 minutes) Local Peruvian cuisine (10 minutes) and a crafts fair (20 minutes). From here you can take a bus to the historic center of Lima, Miraflores or agency or bus as Cruz del Sur. The property is close to supermarkets, banks, pharmacies, clinics. Aeropuerto Hostel has 2 bedrooms and 2 bathrooms. Double room has 2 beds (1 plaza and 1 plaza half) 40m2, with a window to the street, it is a private room with bedding (sheets) and drawing board. Quadruple Room have 4 beds(1 plaza each) with windows 60m2 its a collective room with bedding (sheets)with so bathrooms are outside the room! With hot water!